I have no words to say how I’ve been waiting for this concert ever since before it was announced. Pretty much the same way I’ve been waiting for James Bay’s new album, “Electric Light”. I’ve been probably waiting for it since the moment the previous concert, and the first one I’ve attended, ended. I can probably count my favourite artists on the fingers of my hands, and when I say favourite I mean those artists that I don’t want to miss live and I learn the lyrics of their songs by heart. Well, James Bay is one of those artists and he is high on top of the list. And it all started with “Hold Back the River” back in 2014. The announcement that he was going to play in Gröna Lund made me book June 14 months in advance: this evening was taken! The new album came out a few weeks ago but singles from it are available ever since February. The first one, “Wild Love”, was not what I expected. After “Chaos and the Calm”, which is a great rock album, the first single from the new album was too pop-r’n’b-ish for my taste. But James Bay didn’t disappoint and the next singles and the album as a whole are now a constant presence in my playlists or, better said, they are just a playlist that goes on and on and on in my Spotify app. And the acoustic version of “Wild Love” is not that bad, in the end. But the concert tonight. WOW! He started with “Wasted on Each Other” and “Pink Lemonade”, both from the new album, to go into the previous one with “Craving” which is one of my favourite songs from him. One by one, old and new songs were performed, from ballads to rock’n’roll tracks that made the crowd go crazy. People danced, clapped and sang along and I have to say that this was probably one of the most active crowds that I’ve ever seen in Gröna Lund. Everybody sighed when it was time for “Let It Go” and we took care of singing the chorus instead of James. The same happened to “If You Ever Want to Be in Love”. The end of the concert was an explosion of sound, energy and joy as it culminated with “Just for Tonight” and, of course, “Hold Back the River”. The encore was a cover of “The Best” (Bonnie Tyler). James took the time to talk to the audience, to present his very talented band members and to put a lot of soul into his performance. During “Slide” , which you can watch & listen to below, one could only hear his clear voice and the piano, and occasionally the screams of the people from the rollercoasters. Every now and then James would look in the direction of the fast speeding amusement park attractions a bit annoyed that it was ruining the atmosphere of his very beautiful and gentle song. And I have to say that yes, it was annoying! But business must go on as usual for Gröna Lund, otherwise we wouldn’t get the chance to see so many concerts with just a Summer pass. Overall, the concert didn’t disappoint, on the contrary. James’s voice is a pleasure to listen to, the songs are catchy and live both him and his band sound amazing. I told all my friends to go see him live if they have the chance. I know I will be in the crowd next time I have the opportunity to see him live again. 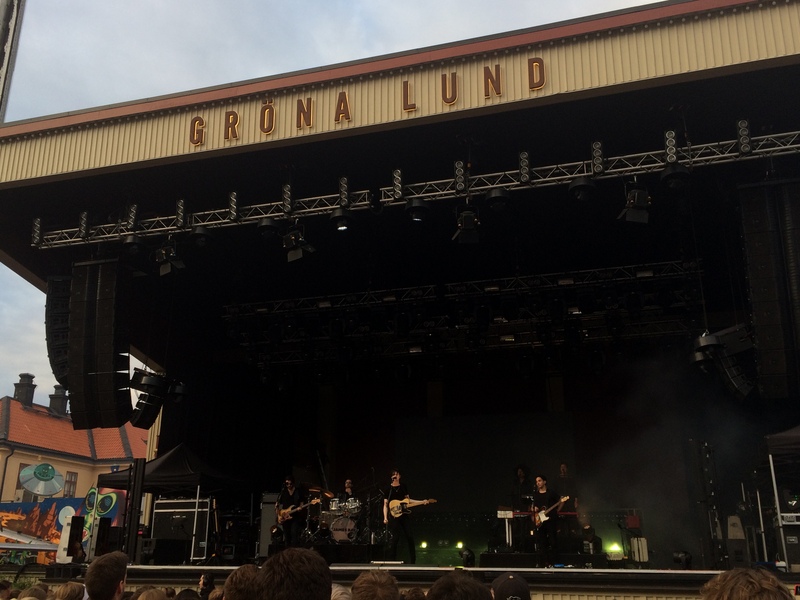 This entry was posted in Day to Day, English, Music Stuff and tagged concert, Gröna Lund, James Bay, music, Stockholm. Bookmark the permalink.